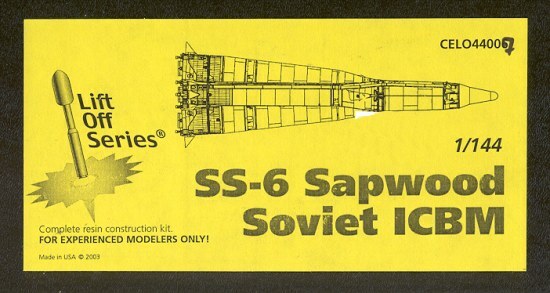 The Korolev design bureau’s R-7/SS-6 Sapwood was the world’s first intercontinental ballistic missile (ICBM). Though R-7s were never widely deployed, the launch systems became the basis for the most successful satellite launch booster in the world. The parameters of the R-7 were first outlined in a Soviet governmental order from February 13, 1953 that called for the development of a two-stage ballistic missile with a range of 8000 km with a payload carry of 3,000 kg and a gross liftoff weight of 170 tons. However, the design specifications where changed to incorporate the thermonuclear warheads, which were found to weigh approximately 6,000 kg. The resulting increase in payload weight reduced the missiles ranged to only 5,500 km. As a result, to preserve the previous range specifications, it was necessary to redesign the missile. In the end, weight saving measures where incorporated into all facets of the program allowing for the payload increase and preserving the necessary range. Instead of using stacked stages typical of U.S. systems the R-7 (and subsequent Soyuz rockets) arranged its boosters laterally around a single core rocket. The R-7 rocket consisted of five parts, a core stage surrounded by four strap-on boosters. The strap-on boosters, utilizing the RD-107 rocket, formed the first stage of the system. The RD-107 had four main nozzles with two steering vernier engines which gimbaled on one axis. The core stage utilized a RD-108 rocket (which is essentially a RD-107 with four steering verniers (flight control), became the second stage. All stages are fueled by liquid oxygen and kerosene. During one of the initial tests of prototypes during 1957, the world's first artificial satellite, Sputnik I was launched into orbit. First deployment of combat ready missiles was in early 1960, mostly in Northern Russia where they could reach targets in the U.S. by traveling over the North Pole. The R-7 was never deployed in significant numbers. The missile took too long to fuel, its above ground launch facilities were large and vulnerable to attack. Finally, the system could only be only be held on standby for 24 hours before the propellant seals began to fail. Fewer than ten were believed to be nuclear deployed, with only one dedicated ICBM pad was built at Baikonur, and six to eight in the Angara complex at Plesetsk. As a nuclear weapons platform, the R-7 was quickly became obsolete do to rapid technical improvements. Among these improvements was the development of zero warning rockets, utilizing storable propellants and smaller warheads. By mid-1968 the SS-6 ICBM had been phased out of the operational inventory. Use of the SS-6 is now restricted to space applications, the typical fate of old ICBMs. 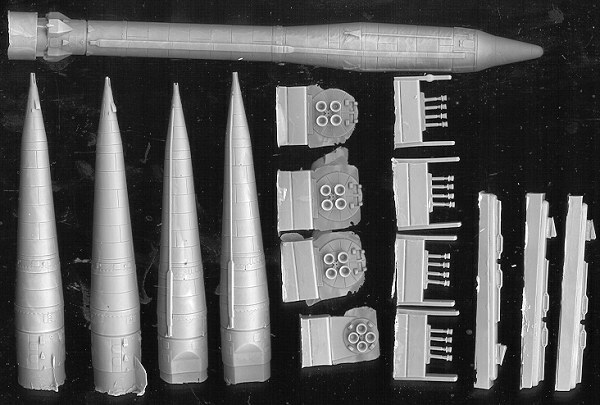 Molded in a medium grey resin, the kit itself includes the central rocket and four strap-on boosters as the major pieces. There are four main nozzle assemblies for the boosters (my sample was missing one of those and I'll ask for a replacement) as well as the central nozzle assembly. Late note: the part arrived within a week of my e-mail to Cutting Edge. Thanks, folks. There are four sets of auxiliary nozzles provided totaling 16 nozzles. Only ten are really needed so you have spares. Same goes for the other resin frets. These supply the straps to hold the boosters together. Only four are needed but the instructions lead one to believe that they will be fragile so it is nice to have spares. One is also given some small vents on these frets. Thanks to the weight of the parts, I found that most of the small finlets attached to the boosters had broken off during shipment and one cannot be found anywhere. Repairing this kind of damage is pretty standard with resin kits and detail sets. The instructions give good guidance as to building the kit. There really are not that many parts to it so construction should move along rather rapidly once all the bits are removed from their resin plugs. Photos are used to assist where there may be doubt. The images in this kit are for a Vostock, but it uses the same basic booster so are quite helpful. There are no decals. The only thing really missing from the instructions is any indication of what color this thing is. If any of you have that info, I'd appreciate it. An initial web search didn't help as what photos I found were in black and white. The kit appears to be very accurate and with some careful construction (due to some small and fragile parts), should turn into an excellent model. It is a rather unusual subject and while some may blanche at the price, it is accuracy and detail you are paying for and with this kit you get it.